We the People, launched September 22, 2011, is a section of the whitehouse.gov website (under President Barack Obama) for petitioning the administration's policy experts. Petitions that met a certain threshold of signatures were typically reviewed by Administration officials who prepared and issued official responses, however, this was not always the case. Criminal justice proceedings in the United States and other processes of the federal government are not subject to White House website petitions. We the People, rather, served as a public relations device for the Obama administration to provide a venue for citizens to express themselves. On August 23, 2012, the White House Director of Digital Strategy Macon Phillips released the source code for the platform. The source code is available on GitHub, and lists both public domain status as a work of the U.S. federal government and licensing under the GPL v2. On December 19, 2017, the Trump administration announced its intention to shut down the website and replace it with a "new platform would save taxpayers more than $1m a year." As of January 2019, the site is operating as it was before it shut down. Users who wish to create a petition are required to register a free whitehouse.gov account. To sign a petition, users only need to provide their name and their email address, and they will receive an email with a link that they must click to confirm their signature. It is not necessary to have a whitehouse.gov account to sign a petition. Under the Obama administration's rules, a petition had to reach 150 signatures (Dunbar's Number) within 30 days to be searchable on WhiteHouse.gov, according to Tom Cochran, former director of digital technology. It had to reach 100,000 signatures within 30 days to receive an official response. The original threshold was set at 5,000 signatures on September 1, 2011, was raised to 25,000 on October 3, 2011, and raised again to 100,000 as of January 15, 2013. The White House typically would not comment when a petition concerned an ongoing investigation. "It's unclear whether Trump's advisors will make a tradition of publicly responding to petitions from the American people," Dell Cameron wrote for the Daily Dot on the day that Trump was inaugurated, noting that the Trump administration that same day "archived" (that is, deactivated) all petitions in progress on the 'We the People' site. New petitions were created, but only two petitions—both created on Inauguration Day—soared above the 100,000-signature threshold within the Trump administration's first week, while other petitions created subsequently seemed not to count signatures at all. The website was later fixed to count signatures but the Trump administration did not respond to any of the petitions until March 2018. In November 2012, a petition was created urging the government to create a Death Star as an economic stimulus and job creation measure gained more than 25,000 signatures, enough to qualify for an official response. The official (tongue-in-cheek) response released in January 2013 noted that the cost of building a real Death Star has been estimated at $852 quadrillion and at current rates of steel production, would not be ready for more than 833,000 years. The response also noted that "the Administration does not support blowing up planets" and questions funding a weapon "with a fundamental flaw that can be exploited by a one-man starship" as reasons for denying the petition. Following the spree shooting in Newtown, Connecticut on December 14, 2012, a petition for new gun-control measures achieved 100,000 signatures within 24 hours. In February 2013, a petition started by OpenSignal co-founder and digital rights activist Sina Khanifar reached the 100,000-signature threshold required for a response from the White House. Two weeks later, the Obama administration issued a response urging the FCC and Congress to take and legalize cell phone unlocking. A year later, Congress passed the Unlocking Consumer Choice and Wireless Competition Act, the first piece of legislation driven by an online petition. The bill was signed into law by President Obama on August 1, 2014. In March 2015, as the United States and the P5+1 group were negotiating with Iran on an agreement to restrain Iran's nuclear program, 47 Republican Senators sent an open letter to the leaders of Iran strongly suggesting that a future president or Congress could nullify any such agreement. This action was widely construed as deliberate interference with the negotiations, and possibly a violation of the Logan Act. In response, several similar petitions were posted on March 9, 2015. One petition, entitled "File charges against the 47 U.S. Senators in violation of the Logan Act in attempting to undermine a nuclear agreement", passed the 100,000-signature threshold within one day. The petition had reached the number 1 spot, garnering more than 320,000 signatures by April 8, 2015, more than three times the number of signatures required to qualify for a response from the White House. For a variety of reasons, however, pundits, news analysts and legal scholars are largely skeptical that the petition will receive a favorable response leading to the requested prosecutions. "Within hours" of President Donald Trump's inauguration on January 20, 2017, two petitions had been started on the site. One, for the release of his taxes, "with all information needed to verify emoluments clause compliance" reached the 100,000 signature threshold within twenty-four hours. Another, for the President to divest himself of his assets or put them in a blind trust, had some seventy-seven thousand. On January 22, Presidential aide Kellyanne Conway declared that the tax returns will not be released. On January 27, the petitions had over 385,000 and 119,000 signatures, respectively, with the former being a record number of signatures for any petition on the site. By the February 17 deadline to reach 100,000 signatures, it had exceeded one million signatures, making it the first petition on the site to do so. Concerns about the efficacy of We the People have been raised since before the first White House responses were published. On August 13, 2013, the Washington Post website published an article about 30 petitions that had been left unanswered for an average of 240 days despite each having met the signature goals. The article refers to the website www.whpetitions.info for taking "its own tally and highlights petitions that have received enough signatures but have not received responses." As of 16 October 2016, 323 White House petitions have met their signature thresholds. The White House has responded to 321 of them (99%) with an average response time of 117 days. Average waiting time so far for two unanswered petitions: 23 days, according to whpetitions.info. The total number of petitions created and percent that have reached an actionable level beyond a response are unable to be determined at this time. Criticism has been directed[by whom?] at the choice of administration official to answer the petitions regarding the legalization of marijuana. Gil Kerlikowske, the Director of the Office of National Drug Control Policy, was chosen to craft the administration's response. The criticism stems from the Office of National Drug Control Policy Reauthorization Act of 1998, which states that the Director must oppose all attempts to legalize the use of illicit drugs in any form. Other discussions of We the People have focused on its technical glitches, democratic rationale, and political dilemmas. There is criticism about the willingness of the administration to answer petitions that meet the threshold for response, when several qualifying petitions have been unanswered for months or years. In addition, the digital divide means that poor communities will have difficulty participating equally in We The People. During the first weeks of the presidency of Donald Trump, The Independent and The A.V. Club reported that many popular petitions did not appear to be receiving any signatures. Additionally, certain URLs to the petitions led to error pages. Macon Phillips, the man behind We the People, told BuzzFeed News that the issue stemmed from issues with its cache. He also thought that Trump's administration "is still trying to get their heads around how it works". ^ Phillips, Macon. 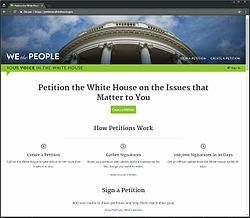 "We the Coders: Open-Sourcing We the People, the White House's Online Petitions System". The White House Blog. Retrieved August 28, 2012. ^ "We the People GitHub repository". GitHub. Retrieved February 11, 2013. ^ "White House to 'temporarily' shut petition website". BBC. BBC. Retrieved December 19, 2017. ^ Cochran, Tom (December 1, 2016). "Farewell to Obama, our first digital president". Recode. Retrieved February 26, 2018. ^ Phillips, Macon (September 1, 2011). "We the People: Announcing White House Petitions & How They Work". whitehouse.gov. Retrieved February 10, 2013. ^ Phillips, Macon (October 3, 2011). "A good problem to have: Raising the signature threshold for White House petitions". whitehouse.gov. Retrieved August 13, 2015. ^ Phillips, Macon (January 15, 2013). "Why We're Raising the Signature Threshold for We the People". whitehouse.gov. Retrieved February 10, 2013. ^ Cameron, Dell (January 20, 2017). "Trump's team removes all old, pending 'We the People' petitions". Daily Dot. Retrieved January 28, 2017. ^ Lieberman, Tucker (January 28, 2017). "Under Trump administration, 'We the People' White House petition website is mysteriously broken". Disruptive Dissertation. Retrieved January 28, 2017. ^ a b Shawcross, Paul (January 11, 2013). "This Isn't the Petition Response You're Looking For". Wired. Retrieved January 13, 2013. ^ "White House Rejects Death Star Petition: Doomsday Devices US Could Build Instead". International Business Times. January 15, 2013. Retrieved March 12, 2015. ^ "It's a trap! Petition to build Death Star will spark White House response". ^ "US shoots down Death Star superlaser petition". BBC News. January 12, 2013. ^ "Here's How Cell Phone Unlocking Became Legal". The White House. Retrieved March 12, 2015. ^ "Answering the Public's Call". The White House. Retrieved March 12, 2015. ^ Tal Kopan (January 20, 2017). "What happened to Obama's White House website?". Retrieved January 20, 2017. ^ Greenwood, Max (January 26, 2017). "Petition for Trump's tax returns gets record number of signatures". The Hill. Retrieved January 27, 2017. ^ Davis, Julie Hershfeld (January 22, 2017). "Trump Won't Release His Tax Returns, a Top Aide Says". New York Times. Retrieved January 23, 2017. ^ Manning, Allee; Kelly, Kaitlyn (February 17, 2017). "One Million People Demand Trump's Tax Return, Smashing Petition Record". Vocativ. Retrieved February 17, 2017. ^ Musgrave, Shawn (August 24, 2017). "White House 'antifa' petition written by pro-Trump troll". Politico. Retrieved August 25, 2017. ^ Josh Feldman (April 2, 2014). "New White House Petition Demands the White House Actually Answer White House Petitions". MediaIte. ^ Hooton, Christopher (January 23, 2017). "White House petition to save arts funding not registering signatures". The Independent. Retrieved January 30, 2017. ^ PenzeyMoog, Caitlin (January 26, 2017). "White House petitions are basically turned off". The A.V. Club. Retrieved January 30, 2017. ^ Montgomery, Blake (January 27, 2017). "No, Signatures On The White House Petition Site Aren't Intentionally Frozen". BuzzFeed. Retrieved January 31, 2017. This page was last edited on 10 April 2019, at 08:53 (UTC).